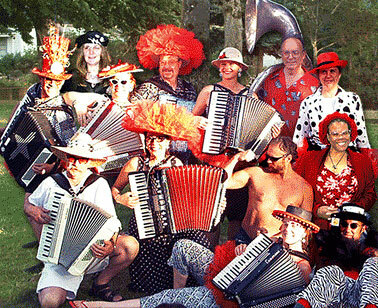 Accordions Anonymous (A.A.) is a 10 piece ensemble and "support group" for oppressed accordion players. A.A. blends vaudeville schtick, outrageous costumes, and improvisational humor with a diverse, multi-cultural repertoire, ranging from rock covers to an operatic aria; with polkas, waltzes, Latin, tangos, swing, Tex-Mex and much more in between. Besides the mighty sound of massed accordions, members also play tuba, drums, guitar, mandolin, ukulele, harmonica, and Charango. Formed in 1998 as a musical refuge for accordion addicts, “A.A.” has evolved into a colorfully entertaining group of fearless accordionists. After years of performing, parading, and working the “12 steps to Accordion Awareness”, A.A. is ready to bring their visual and musical feast to your stage.